The term "sawmill gravy" probably comes from early logging camp food. The gravy can be made with bacon and bacon drippings. 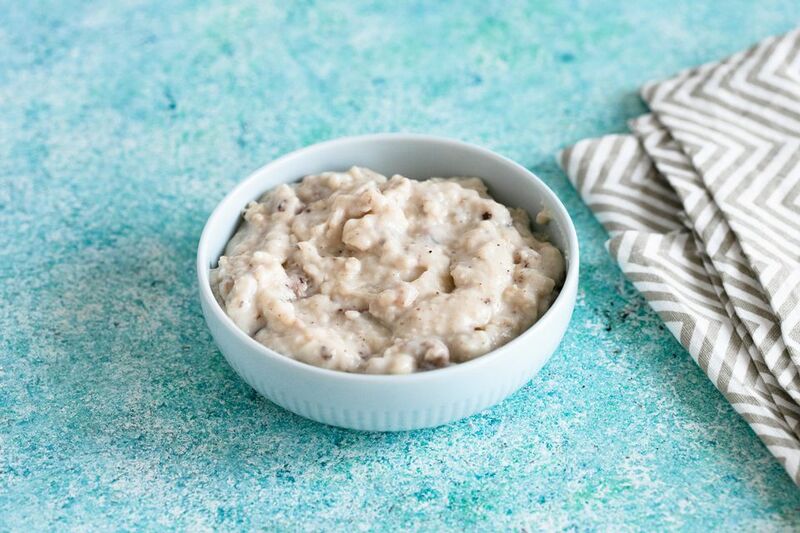 This version is a sausage gravy, a breakfast tradition in the South. The gravy is thick and creamy with chunks of breakfast sausage. Serve the gravy with split and buttered biscuits or creamy grits. In a heavy skillet over medium heat, cook the sausage, breaking up and stirring until no longer pink. Remove the sausage with a slotted spoon and set aside. Leave 3 tablespoons of drippings in the skillet. If there aren't 3 tablespoons left, add some butter, shortening, or bacon drippings to make 3 tablespoons. Place the skillet back over medium heat and sprinkle 3 tablespoons of flour over the drippings. Cook, stirring constantly until the roux is lightly browned. Gradually add 1 cup of milk or light cream. Taste and season with salt and pepper and keep stirring until the gravy has thickened. Add more milk or cream, as needed to reach the desired consistency. Add the sausage to the gravy, if desired. Serve and enjoy on top of biscuits. Sawmill Gravy With Bacon: Fry 4 to 6 strips of bacon in the skillet and leave 3 tablespoons of drippings. Proceed with the recipe and serve the gravy with the bacon, if desired.